Join us for this poetry slam that will determine the 2018 Out Loud HSV poetry slam team! The top poets from January's qualifier events will be competing, with the top 5 set to be the 2018 team. If a top ranking poet cannot commit to the teams practice and performance schedule, that poet forfeits their place and we bring up the next ranking poet to fill the slot. The team will be competing in the 2018 Southern Fried Poetry Slam in San Antonio TX! Poets must have ranked in the top 6 of their qualifying round to compete in this slam. 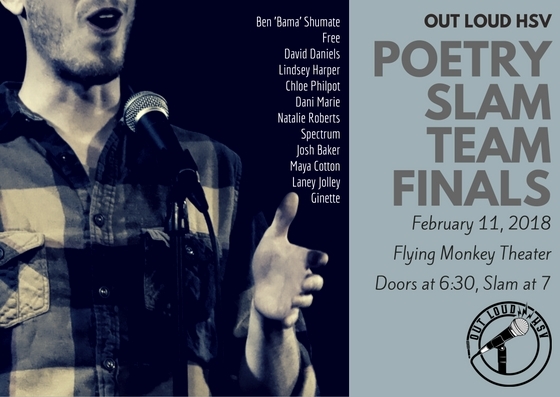 Poets should have confirmed with the slammaster of their attendance to finals at least one week prior to this slam.